﻿ Is Statue of Unity a good place for tourists ? Is Statue of Unity a good place for tourists to visit in India? Yes, It was well planned project to boost tourism in Gujarat. The bus service will have a pick up point at Ek Bharat Shreshth Bharat Bhavan, the guest house near the Statue of Unity where the parking area is also located. Moreover, cafeterias, restaurants and other outlets of renowned food chain have also become operational. 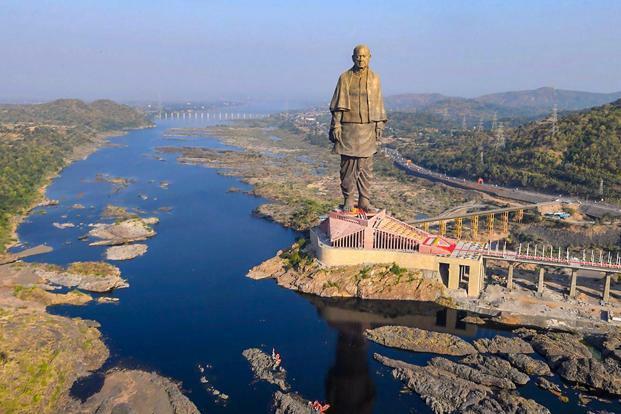 Two super-fast elevators installed at the statue’s core to take visitors up to the statue’s chest to view a panoramic scene of the surrounding countryside, including the Sardar Sarovar Dam with its huge reservoir, and dozens of villages. Below the statue will be a three-storey visitors’ centre housing a museum, an audio visual gallery, and a laser and sound show—all designed around the theme of unification of India. A three-star hotel with 52 rooms and two tent cities with 250 tents are currently under construction to accommodate the flocks of history buffs and tourists visiting the statue. ‘Valley of Flowers’ a 17-km carpet of planted flowers in multicolour hues will surround the statue and it will open for the visitors for touring. This investment is not useless as some claims to be. It could be an ever attracting source for tourists just like Taj Mahal. Yes Statue Of Unity can be a one time visit for tourists. However I do hope that India does not follow this way of tourism and starts to build lifeless Statues . I have heard that many LIFELESS Statues are on the works.